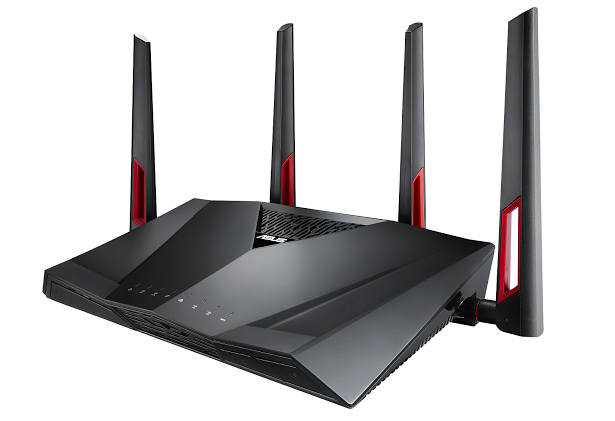 Kuala Lumpur, Malaysia (23rd February, 2016) — ASUS Malaysia today announced RT-AC88U, an ultra-fast AC3100-class dual-band 802.11ac wireless router with a four-transmit, four-receive (4×4) antenna configuration. This high-performance, easy-to-use router uses Broadcom NitroQAM technology to deliver a combined dual-band data rate of up to 3167Mbit/s — 2167Mbit/s on the 5GHz band and 1000Mbit/s on the 2.4GHz band. RT-AC88U is perfect for low-latency online gaming, smooth 4K/UHD video streaming and extremely-fast file-sharing. The four-antenna design combined with ASUS AiRadar and universal beamforming ensure that RT-AC88U gives superb multi-device performance with wide, reliable and fast coverage. Online gaming enthusiasts will also appreciate the fact that RT-AC88U is the world’s first router with a built-in gaming accelerator powered by the Gamers Private Network (GPN) from WTFast for the ultimate low-ping gaming experience. Other innovations in RT-AC88U include support for 802.3ad Link Aggregation, which allows two Gigabit Ethernet LAN ports to be combined into a super-fast 2Gbit/s wired connection . 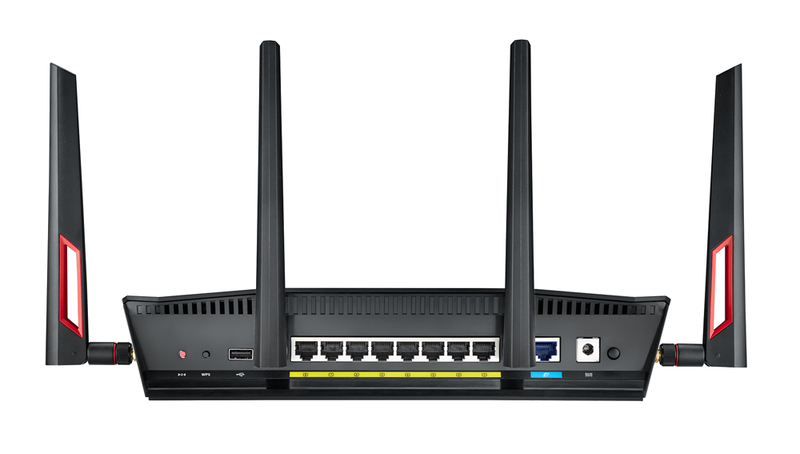 Requires client device with two network ports and 802.3ad Link Aggregation support RT-AC88U is the ideal choice for users with busy multi-device home networks who need extreme coverage, lightning-fast performance, rock-solid stability, ease of use and total peace of mind. RT-AC88U uses Broadcom NitroQAM (1024-QAM) technology to boost maximum Wi-Fi speeds on both the 5GHz and 2.4GHz frequency bands by up to 25% . With NitroQAM, 5GHz speeds can be improved from 1734Mbit/s to 2167Mbit/s, and at 2.4GHz speeds are boosted from 800Mbit/s to 1000Mbit/s. This gives RT-AC88U a combined total data speed of up to 3167Mbit/s for lag-free, low-latency online gaming, smooth streaming of 4K/UHD (ultra-high definition) movies and blindingly-fast file-sharing. NitroQAM requires a compatible client device. With four powerful external dual-band antennas, configured in a 4-transmit, 4-receive (4×4) MIMO design on both bands, RT-AC88U provides extremely stable Wi-Fi coverage, ideal for multi-room and multi-level homes. Exclusive ASUS AiRadar uses universal beamforming technology to focus the wireless signal towards devices, resulting in clearer and faster connections with fewer interruptions. ASUS RT-AC88U includes an exclusive built-in client and a free subscription to WTFast that gives users the very best online gaming experience — at no extra cost ! WTFast uses GPN, a dedicated global private network, which automatically gives users the lowest ping times and reduced latency — critical network parameters in online games — for smooth, uninterrupted gameplay. GPN can reduce average game ping times by 30-60%, lower average speed deviations by 70-90%, and cut bad router hops by 70-90%. By routing gaming data packets automatically via the most efficient internet route, packet loss is reduced, ensuring a responsive and frustration-free gaming experience. RT-AC88U owners get the basic WTFast solution free, without advertising. This version includes WTFast technical support, and is limited to accelerating one device at a time. For simultaneous acceleration of multiple devices, users must purchase a premium account. GPN supports virtually all competitive multi-player online games, and has optimized settings for many of the most popular titles. The game accelerator is integrated into RT-AC88U’s easy-to-use ASUSWRT graphical user interface, so it consumes no system resources on the game device. This also means that the benefits can be experienced on any gaming platform — including Windows, Mac OS, Linux and game consoles — regardless of the manufacturer or operating system. For the ultra-high-performance wired networking demanded by smart homes, RT-AC88U has eight Gigabit Ethernet network ports — twice as many as a standard router — and supports 802.3ad Link Aggregation, a technology usually only found in professional networking equipment. Link Aggregation allows users to combine two of RT-AC88U’s Gigabit Ethernet ports into a single 2Gbit/s wired connection, using two network cables between the router and a compatible device. Link Aggregation is ideal for use with bandwidth-hungry 802.3ad-compatible network-attached storage (NAS) devices, which can often swamp a standard 1Gbit/s network connection — for example, when performing data backups from multiple devices. RT-AC88U allows users to overcome this bottleneck for ultra-fast data transfers across their home network. With eight Gigabit LAN ports, users can now connect even more devices to their home network without the need for expensive extra network switches. The ASUS RT-AC88U is available for purchase at the recommended retail price of RM 1,799 (~US$ 419), inclusive of GST.